Little over 18 months since they blew all the music blogs away with ‘Lawman’, Dublin-formed four-piece Girl Band are signed to Rough Trade Records, and releasing an incendiary debut which sets surrealistic lyrics to savage, techno-inspired noise-rock. 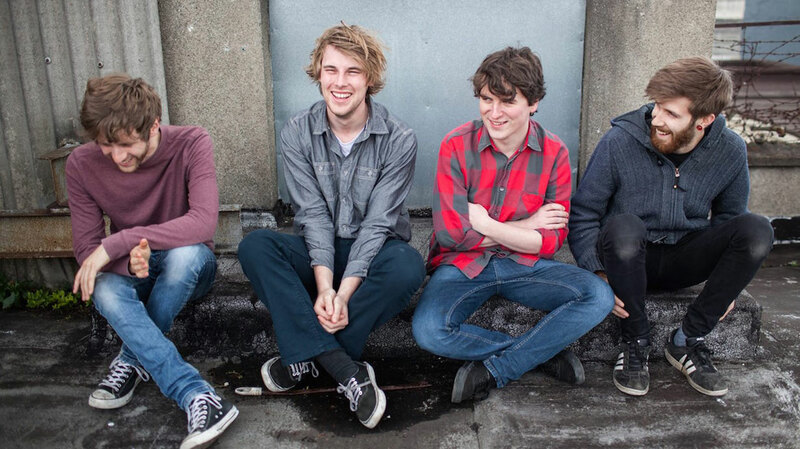 Here, guitarist Alan Duggan discusses the band’s roots, and explains how a breakdown inspired Holding Hands With Jamie. Hi Alan, can we talk about the formation of Girl Band, please? How long have you guys known each other? Well, myself, Dara [Kiely, vocals] and Daniel [Fox, bass] used to be in a different band when we were teenagers, which was a pretty terrible group. So we’ve been playing together since we were about 16, I’d say? 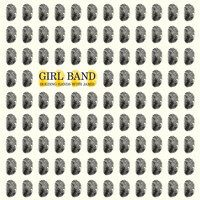 Girl Band officially started in 2011; we had our first gig in the summer of 2011, in a little record store in Dublin. What was the name of the band you were in prior to Girl Band? The band before Girl Band was called Harrows. Dara was on the drums, and it was myself and Daniel and then we had another singer and another guitar player. We learned a lot from being in that band, about how not to be in a band, you know?! The whole thing was very Spinal Tap: nothing worked and it was a bit of a disaster. But we were teenagers and it was fun, and we learned a lot about writing songs. But the music’s pretty awful – I wouldn’t recommend listening to it! I always loved idea of creating something really unsettling, that you don’t understand, but you’re dancing to it. What kind of music did you bond over when you first met? Well, it’s kind-of developed the whole time, because we’re all friends. I mean, Adam [Faulkner, drums] was the only person that joined the band, independently of being in our immediate group, so it’s like any group of friends where you’ll all like one type of thing and then you’ll progress to another. I think one thing we all mutually agreed upon was that we didn’t want to be a standard Radiohead-type indie guitar band. At the time there was a lot of bands around Dublin who either sounded really like In Rainbows or else really like The Libertines. So while we didn’t know what we wanted to do, we knew that we definitely didn’t want to take direct influences from that type of music. Well, you definitely sound nothing like either of those bands. For the benefit of anyone yet to hear Holding Hands With Jamie, what can they expect? The first surprise when we listened to the album was that it all new material. Even though ‘Lawman’ appeared on your Early Years EP, we expected it to appear on your debut. Well, we released ‘Lawman’ as a 7" single in 2014, and then when we signed to Rough Trade, at the end of 2014, they wanted to re-release some of the material on 12", mainly to introduce us in the US. So we feel that song’s done its thing – if people want to find it, they can find it. If it had been released again, on the album, it would be labouring the point, and would have probably felt a bit lame. There’s a real sense of spontaneity to the songs, and you don’t seem bound by the rules that other artists follow in terms of song structure. Can you tell us more about the creative process works, please? Yep, so basically there’s no ringleader in the band and no one massive creative focus; we all write together. We’ll go down to the practice space and we’ll just plug in. Someone might have an idea for a drum beat, or you’ll turn your pedal on and you’ll hit a fret and make a sound and think, “Oh, that sounds ok – let’s do that again.” We come up with a sound or a little groove, and we’ll just repeat that, coming up with different sections and trying to tie them together. We’re constantly refining little transitions to see whether it makes sense. There’s a lot of techno influence as well, and that comes from the fact there are 10 minute-long songs that are really repetitive and build up. That’s something that a lot of us are really, really into, and a lot of weird avant garde music and jazz stuff that we’re into does that as well. Was there any sort of overarching goal sonically for this particular set of songs? I mean, the fact that they were written over a year or a year and a half or so means that I don’t think there was necessarily a goal. But I personally wanted to hear something that sounded very, very noisy and harsh. I always loved idea of creating something really unsettling, that you don’t understand, but you’re dancing to it. When something is really intense but you can’t help but groove to it, it’s a weird sensation. In terms of the sound, production-wise we wanted for the record to have a very live sound, and for it not to sound clean and produced and professional. We love that idea that a band’s first album is their “raw” album, and then they develop it from there. You used some unusual props in the studio, right? Well, we used a Gaviscon bottle for two of the songs – the new single, ‘Paul’, uses it on the bass. It’s to give that sliding noise. If you do it with your fingers you just get big blisters, so now we have a Gaviscon bottle on stage, which is a pretty odd prop. The lyrics detail a breakdown Dara had. Can you remember much about it? Oh, massively, yeah. He had a very messy break-up with a girl, but there was also a lot of stuff going on in his family life as well... He got very, very manic. It happened over the space of a year, so to start with it wasn’t so noticeable. It was actually on our first ever UK tour, in 2013, when I first noticed it. I was living in Prague at the time, and he came over and he was doing cartwheels in Old Town Square, running around. (Laughs) He slept so little. I was like, “Dara seems quite excited!” And he showed up at the airport wearing a woman’s jacket, and stuff like that. When we got back [to Ireland] in the summer, he seemed even happier and happier. Eventually, due to an absolute lack of sleep and being out at all the time, he hit a wall. He’s said in an interview that he didn’t sleep for two or three days in a row and he thought he was God, so he had to go get medicated. He got sedated and he became quite depressed for a good long time – about a year and a half or so. But he’s in really good shape now, which is great. Yeah, so a lot of the lyrical content on the record is about both sides of that. On ‘The Witch Dr’, one of the lyrics mentions him wearing a woman’s jacket, and all the lyrics are things that he was saying to people over and over again. He speaks as fast as he can in the song, because that’s the way he was talking during the whole thing. While it was clearly a very serious ordeal, the way Dara juxtaposes surreal imagery and absurd references – to things like Jürgen Klinsmann and Top Gear – does create humour. And there’s the sense that honesty is the most important thing. Yeah, Dara is precious about his lyrics but he’s not precious about how he’s viewed; he’s honest. Some people romanticise depression a bit – saying it’s something that’s so dark. Whereas he went through a serious, full-on depression and it’s great that he’s able to look back at it and look at how irrational someone could be at that stage. Because sadly, that song about watching Top Gear is kind of autobiographical – he was just bored in his house and didn’t have the energy to do anything. So while he’s not poking fun at the issue, he’s poking fun at himself. In a lot of ways we don’t take ourselves seriously, like in terms of press photos. Occasionally we get press photos back of us looking very serious, and we just look so awkward and uncomfortable in it; like you’re trying to be cool to hang out with your bigger brother or something. (Laughs) It doesn’t really work for us. We’re not unapproachable, cool guys; we’re just normal guys that you’d find at the back of a record store, going through the racks, or something like that, with lots of in-jokes. Is there anything you feel you’ve learned about yourselves as a band in the making of this record? In the recording process, no, not really. But because the album was written was over such a long period of time, and the whole incident with Dara was a big part of it, I think the one thing we learned is that we all get on really, really well. Do you see a lot of tension amongst other bands? Oh yeah. Oh yeah, BIG time. Bands are like, “WHO STOLE MY MILKSHAKE?” (Laughs) Like, “I’m not playing! I’m done.” (Laughs) Or getting really annoyed and hating the fact that they’re at a festival, like (adopts stuck-up voice) ”Urgh, can we please get the f**k out of here now.” We’re like, this is class! What are you complaining about?! I won’t name the bands, but there have been a few that we’ve played with that are proper grumpy little b*****ks. I don’t know, I think this is a pretty good position to be in. So what are your hopes for your debut? I think we’ve achieved what we wanted to. We wanted to record something that we were all really happy with, and we wanted it to be as representative of where we’re at as a live band as possible, and we feel it is. We always saw the record as supporting the tour, as opposed to the tour supporting the record, so off the back of recording the record, we booked our biggest UK tour yet. If people like it or don’t like it, that’s a different thing and we don’t strive for that. It’s not like, “Oh man, we want number one” (Laughs) That’s not going to happen. The other thing was there’s a lot of great bands in Ireland that released their album way too soon and have never toured. And it’s a shame because then it becomes an Irish record that only a handful of people who were involved would know. We want someone to discover our record in 10 years time.